Amylulita says...: June 12th! Rockabilly Birthday Party!! 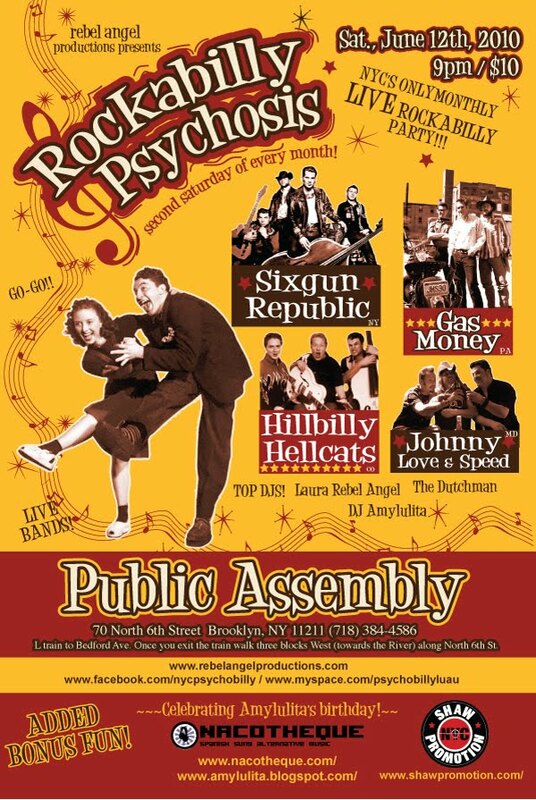 This year I'll be celebrating my birthday extra special stylee at Rockabilly Psychosis. NYC's only LIVE ROCKABILLY Monthly party! Special Guest DJs and Dancers! Rockabilly Madness and Garage Grind! The Dutchman (Dead City) Spinning Northern Soul, R&B classics and Cheap Thrills! rockabilly in Spanish and English! Reduced $5.00 admission after the bands! Age: 21 and over please. Visit http://www.RebelAngelProductions.com/ for all upcoming shows!